sustainable stewardship of the land. aged to enhance flavor and tenderness and flash-frozen to maintain freshness for delivery or shipment. convenient part of your life. 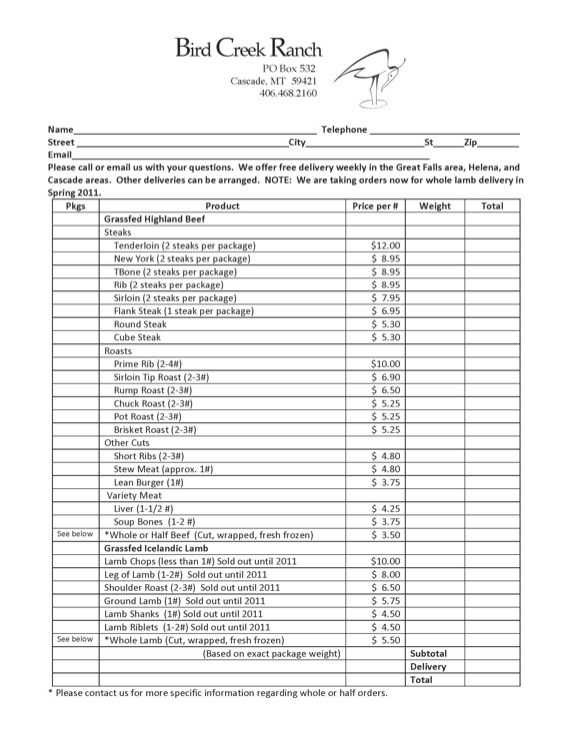 applied to your order and a $.25/pound additional charge added for the service. • Highland skulls, cleaned and finished. $300-$500, depending on horn size. • Highland hides (black or red) with hair on. Garment grade tan. $600-$700, depending on size. • Icelandic pelts (black, white, mixed). Garment grade tan. $100-$400, depending on size and color. • Icelandic roving, ideal for spinning. Natural colors. $8.50 per 4 oz. ball. • Icelandic yarns, sport weight. Natural colors. $9.95 per 2 oz. skein. • Purebred Highland calves available in the fall. • Purebred Highland bulls available immediately. • Limited number of purebred 1-2 year-old Highland heifers available immediately. for help with your order.